Each week, students from across the United States interact with members of the media, government officials, lobbyists and policymakers as current issues are explored through the prism of civics and history. Extend your trip with an additional day in Washington DC, Williamsburg, Virginia or Philadelphia, Pennsylvania. Programs are 6 days and 5 nights in duration. Teachers may choose to follow the student schedule or participate in our parallel teacher program. Registration – Check into your hotel. Arrive early and spend the day downtown. Dinner & Orientation – Program overview and goals discussion. Student Social – Meet your fellow participants. Breakfast & Daily Brief – Meet your instructor and prepare for the day’s activities. Presidential Power: Monument Study Visit – Onsite historical and cultural interpretation at the Jefferson Memorial, Washington Monument and FDR Memorial. Corridors of Power: Neighborhood Exploration – Explore DC neighborhoods such as Embassy Row, K St. corridor, Georgetown and Capitol Hill. 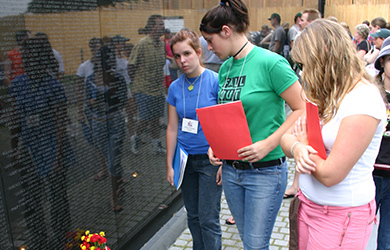 Conflict & Compromise: Monument Study Visit – Onsite historical and cultural interpretation at the Lincoln, Vietnam Veterans, Korean War and WWII Memorials. American Melting Pot Neighborhood Exploration – Introduction to DC neighborhoods such as Adams Morgan, Shaw, U Street Corridor, and Chinatown. Dinner – Local restaurant in Washington neighborhood. Small Group Civics Discussion – Map the physical layout of Washington and the power structure within the city. 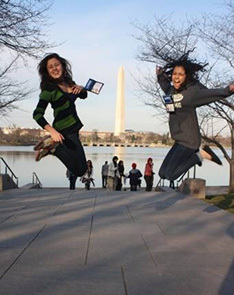 Activity: Civics Scavenger Hunt – Navigate American democracy and utilize the capital city. 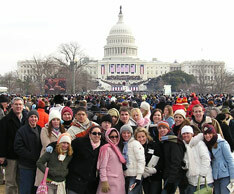 This Week in Washington Seminar – Interact with a member of the national press corps. Explore the role of the individual, media and government in a democracy. Executive Branch Study Visit – Discuss the historical and current challenges facing the Presidency at Lafayette Square, across the street from the White House. 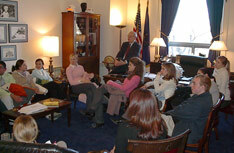 Advocacy Onsite Briefings – Small group discussions hosted by lobbying organizations. Learn how to advocate inside the federal government. Legislative and Judicial Branches Study Visit – Discuss the historical and current role of the Supreme Court. Begin learning about the legislative branch on Capitol Hill. Small Group Civics Discussion – Define today’s political ideologies. Develop your civic voice. Primetime Debate: Principles and Politics – Join two Washington professionals from divergent political backgrounds as they address topics of interest and take your questions. Snack and Speak – Continue the discussion with the Primetime debate speakers and your fellow students. Current Issues Breakout Sessions – Choose an issue: education, gun control, environment, healthcare, civil liberties, international trade or foreign relations. Public Policy Forum – Explore one of the premier public policy choices facing the nation with an expert on the subject. Onsite Small Group Briefings – Discuss policy-making in an interconnected world at foreign embassies, executive branch agencies and nongovernmental organizations. 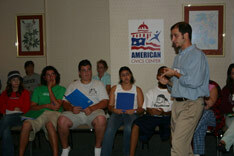 Small Group Civics Workshops – Develop civic skills: writing letters to the editor, volunteering for campaigns, advocating an issue position and motivating others to get involved. Theater – Catch a show at Ford’s Theater, Arena Stage, National Theater or Kennedy Center. Breakfast & Hill Strategy Session – Prepare for activities on Capitol Hill with your teacher and the civicsinstructor assigned to your state. Capitol Hill Activities – Meet with your state’s congressional delegation. Options on Capitol Hill – Visit the Library of Congress, attend committee meetings, explore Supreme Court, or study at the Sewall-Belmont House. School Meetings – with your teacher. Program Evaluation Session – Meet with your Civics Instructor, wrap up the week, evaluate your goals and develop an ongoing strategy for using and sharing your civics skills. Farewell Dinner Cruise – Enjoy a breathtaking view of the city while gliding down the Potomac river. Student Dance – Celebrate a life-changing week with your new friends! We can provide you a price for any start date you desire for your group. If you wish to keep your program as affordable as possible for your students, you may want to consider visiting Washington DC between November and February. In addition, no matter what time of the year you choose to visit, we recommend you start your visit on a Saturday to keep your travel costs down . If you wish to have your students participate in a program with students from other high schools around the U.S., a Saturday start is required. Click the Request A Planning Kit button and we'll provide you a specific price for the date you wish to attend our program. Get started with your free planning kit for any of our programs. For your convenience, we'll send you an email with full pricing details and materials to help you compare providers as you make inquiries. We encourage you to compare the quality and cost of our program to others.